Wedding decor sets the stage for the entire tone of the evening, which is why we, Hitch Studio, take our job of adding beauty to your day so serious. 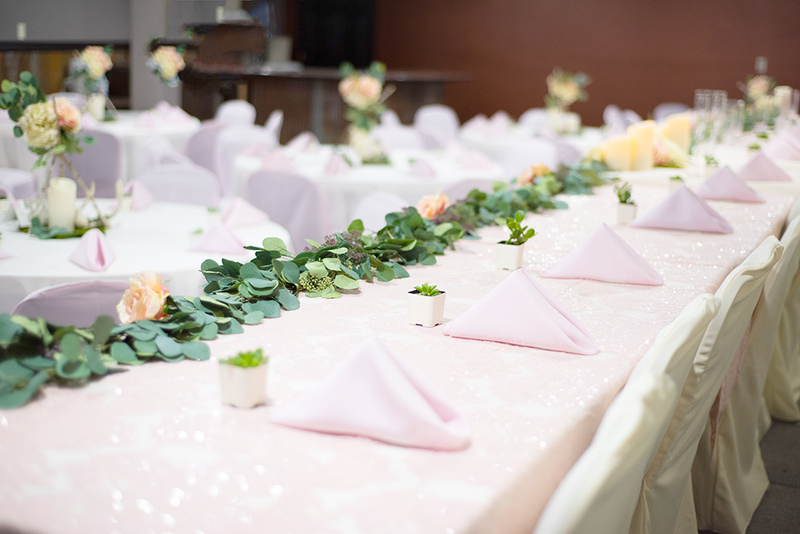 Casey and Dylan’s “Level: 1 Carat” wedding at the Drake Motor Inn, in Watertown, South Dakota, stole the show with their unique centerpieces and custom napkins and chair covers. Though they loved their venue, they really wanted it to stand out. 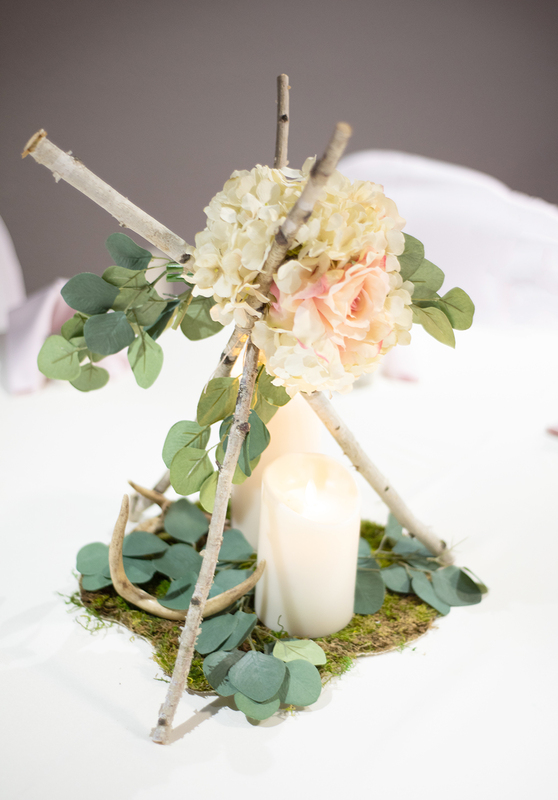 Hitch Studio staff placed a birch stick centerpiece with a beautiful arrangement of hydrangea, blush roses, and eucalyptus at each table. We also added deer antlers and a display of candles, which lit the centerpiece from below for a nice romantic glow! 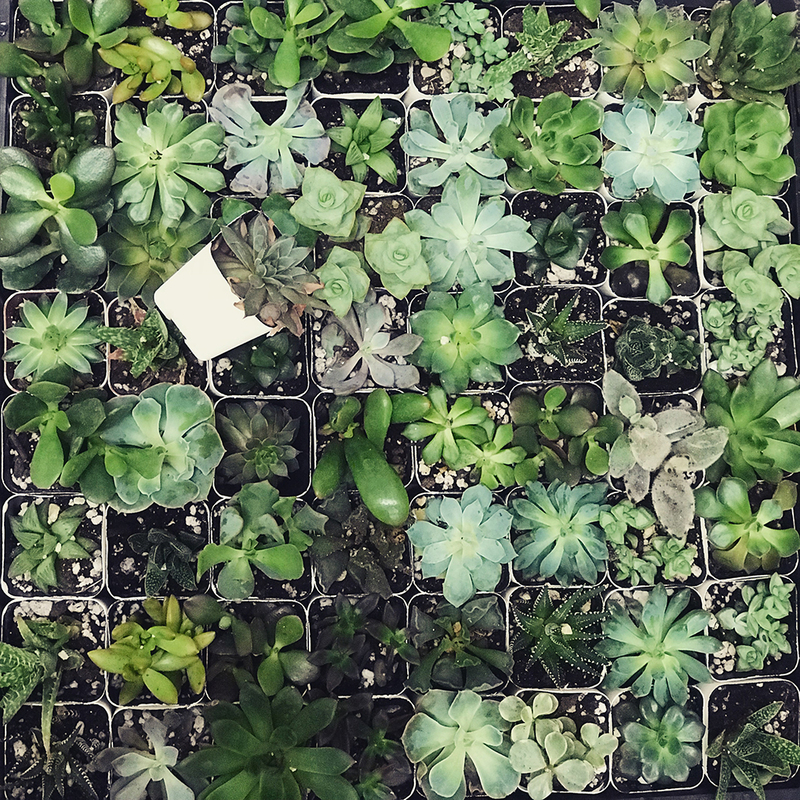 Each guest received a fresh succulent at their place setting which added an extra touch of green and boho to the tables and also excited guests. 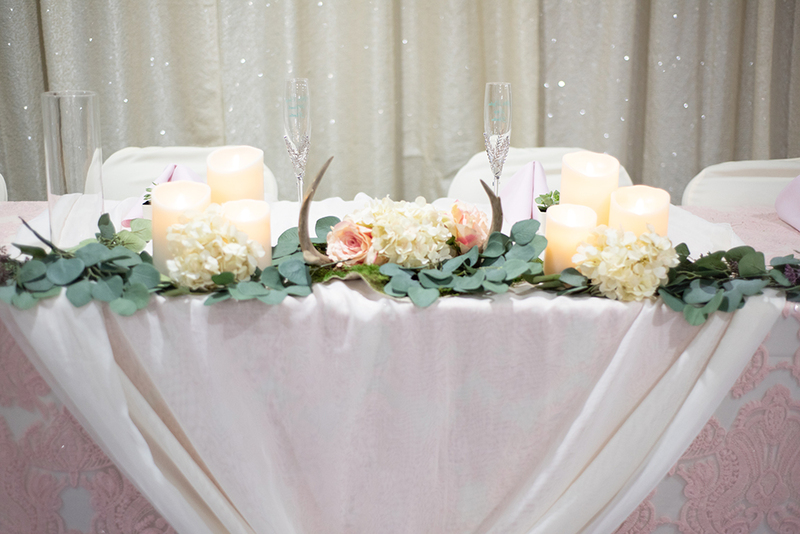 The final touch to the table design was custom chair covers and napkins. 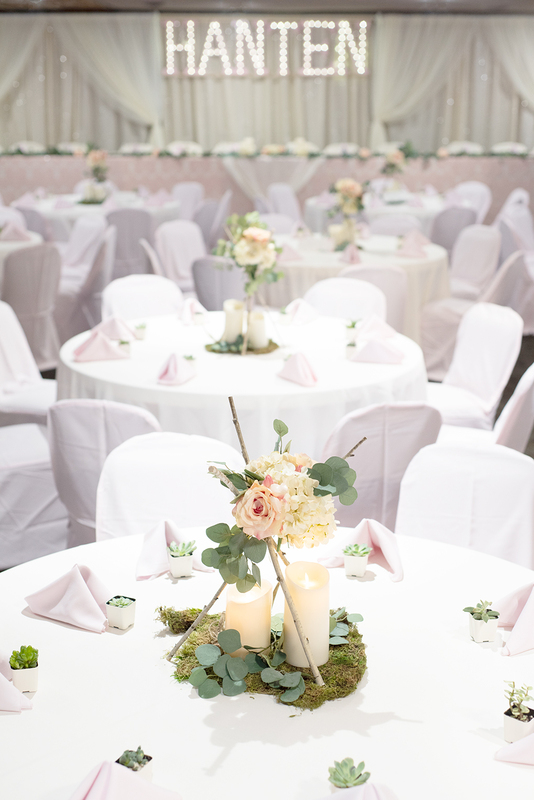 Hitch has access to order nearly any color of napkins, sashes or chair covers so they can match your wedding color perfect! We even provide the service of putting them on and taking them off the chairs, which can save you and your family a lot of time. 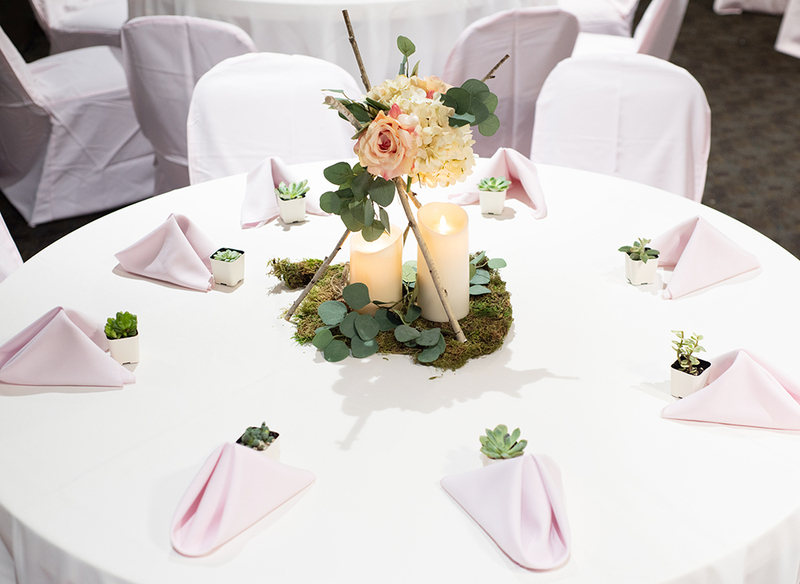 Casey & Dylan chose a blush pink to go with their blush + bohemian + greenery wedding theme! 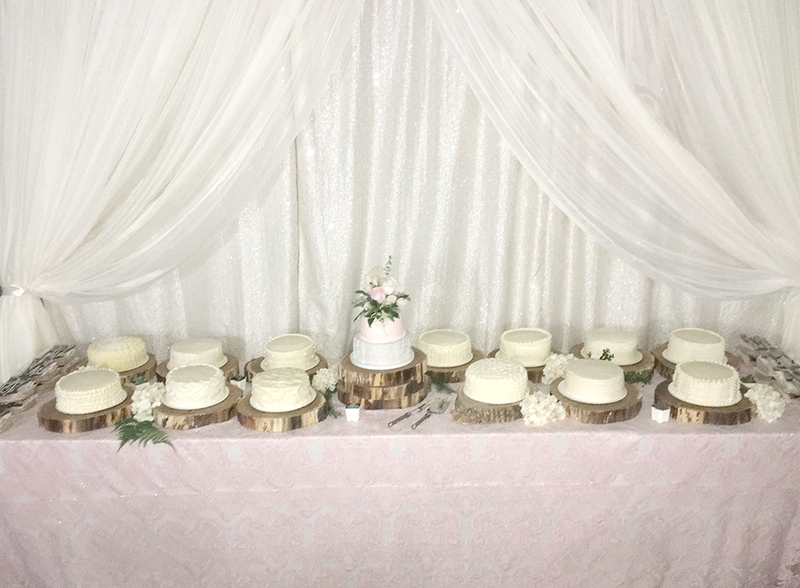 The focal point of the room was the head table which featured an ivory sequin backdrop covered by ivory sheers and a lit personalized sign, created by the bride. 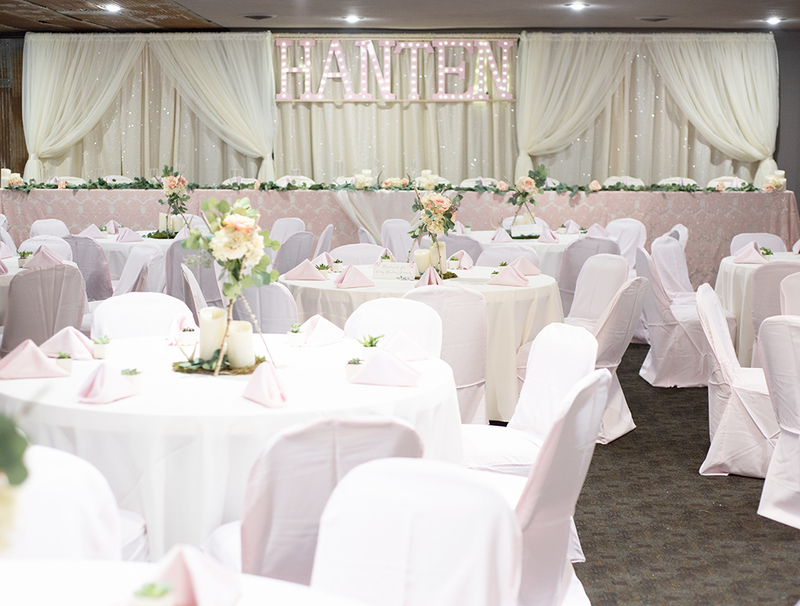 Nightlife Entertainment also provided blush pink up-lighting to add a beautiful glow to the background. Another really personal tough? Casey & Dylan delivered an 8-inch cake to each table after dinner! All 13 tables got their own cake to share family-style as the couple cut the first piece and had the opportunity to greet each table one-on-one. 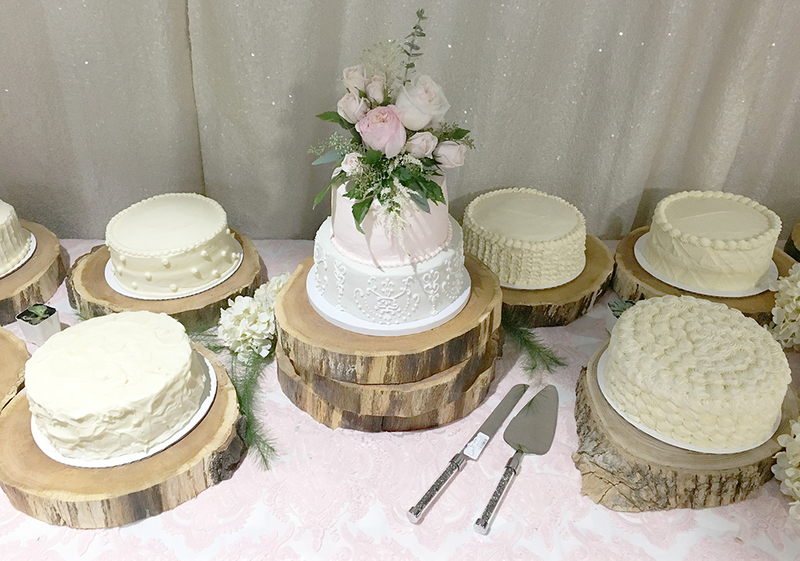 We added a matching backdrop behind their cake table to make it coordinate with the head table look. LOVE THIS TOUCH! Their vision and our hard work took this venue from good to GREAT. Need some help making your wedding venue really pop? Hire Hitch Studio to help with suggestions and the roll-up-our-sleeves hard work to get it all done. If you’re a couple needing additional services, we have add-ons available that we’re happy to help with! It’s our job to make your wedding day run seamless and create an inviting space, filled with warmth and ambience to celebrate your special day. 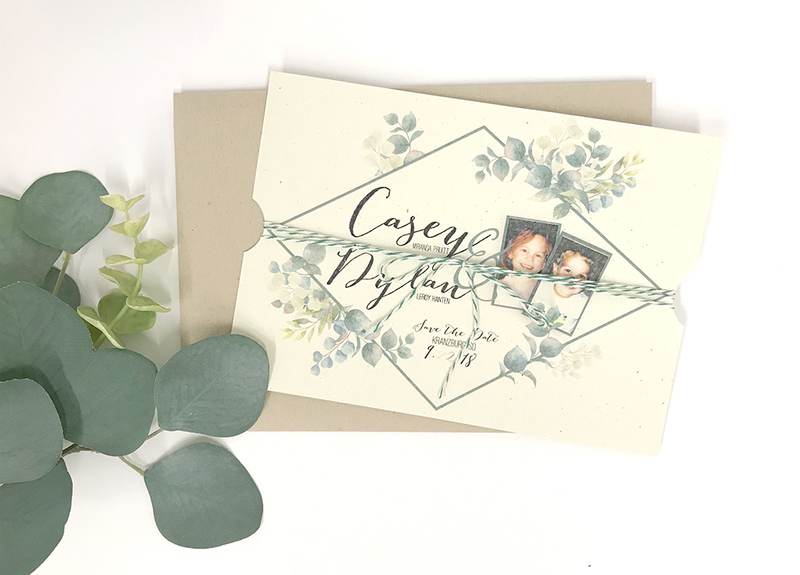 We also had the honor of designing Casey & Dylan’s save the dates, wedding invitations, and programs! 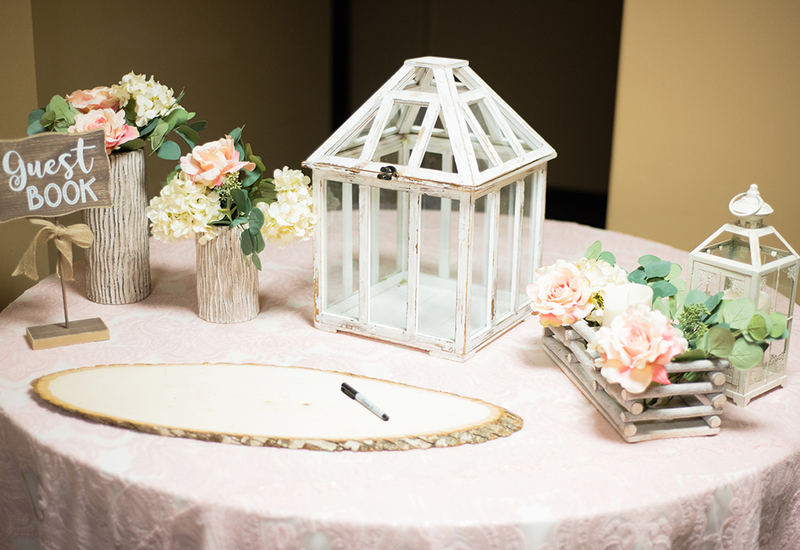 We used fun paper, string, boho themes, and blush pink (of course) to tie them all together. 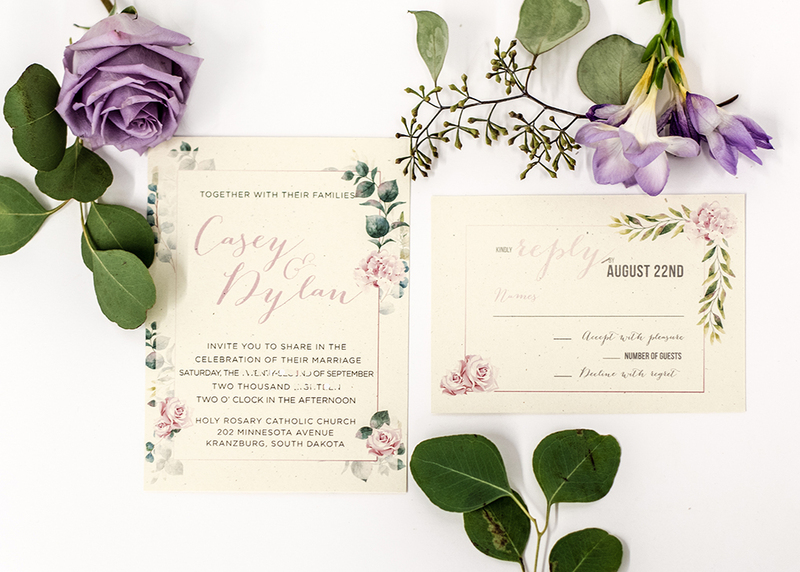 Hitch Studio is your one-stop-shop for saving time and stress…not to mention hours of research and online ordering, just to find out they don’t have your shade of blush pink or the quality of paper you wanted. Sit down with us at our brick-and-mortar store in Brookings, SD. Sip on a tea, coffee, or hot chocolate while we meet, and tell us all about your wedding day. We love to make your vision come to life! Just like this wedding took place in Watertown, SD, Hitch Studio also travels to Sioux Falls, Huron, Marshall Minnesota, and Madison, SD. We’ve gone as far as Mitchell and into northern Minnesota as well, so it never hurts to ask! (Did someone mention Hawaii?) That’s a yes from us.